You want a popular trail, and here’s why: You’re going to meet people, and those people will tell you things. Maybe someone walking toward you will mention that the next shelter down the trail is plastered with signs warning that it’s infected with the norovirus and you should stay away unless you want to spend the next few days pooping uncontrollably like the guy in Zen and the Art of Motorcycle Maintenance. Maybe someone going your direction will hustle past you and shout, “Bear! Big Bear!” as he looks back in terror. The fewer surprises, the better. Also, if you pick a Name-Brand Trail like the AT or the Pacific Crest, you’ll know where to find the next stream or how many miles your current ridge climb will last. (And if you’re not wondering how much more mountain there is ahead of you, then your kids are, in a persistent, nasally sort of way.) These paths are well charted and well maintained. The blazes and trail markers are clear. And you can buy piles of topographic maps that show all sorts of detail. Each adult on the trip should have a topo map; keep that sucker dry. On our trip, we picked a trail section in the Shenandoah National Park that meanders back and forth across Skyline Drive. In the mornings, my stepmom would drive to meet us, and we’d resupply our food. That way we didn’t have to carry five days’ worth of meals, which kept our packs that much lighter. Over breakfast, my daughter would get a chance to tell her grandmother stories about the previous day’s adventures. And we got to cheat a little. Twice, we rode ahead a couple of miles to skip steep inclines that would have shredded my daughter’s legs before lunchtime. One day, my dad rode back to “basecamp” for a nice long nap. No doubt the purists among you object to this idea of backpacking with active car support. But I have little interest in fireman-carrying an exhausted old man out of the woods or splinting a grade-schooler’s twisted ankle just because I wanted to live out some sort of Bear Grylls fantasy. If you insist on bushwhacking through the wilderness, ignoring fatigue and pain, and eating bark for dinner after your food supply gets raided by animals, your children will have a terrible time, and they will refuse to do this ever again. Don’t cheap out on the essentials. You want a well-constructed and waterproof tent, a pack that stays comfortable all day; shoes that fit, and a water filter. Keep an eye out for sales, but don’t be like my cheapskate father, who saved money by MacGyvering a tent with two trekking poles, rope, a ground cover, a poncho, and mosquito netting. This contraption only sort of worked in good weather and became entirely useless once the inevitable monsoons flooded it. Store your clothes in a zip-top plastic bag. Not only does this keep them dry when it rains, it quarantines their stench. After two days of this unwashed, pack-animal vacation, all of your clothing is going to smell like Bigfoot’s nutsack. But if you keep it sealed up tight, that horror won’t seep into your sleeping bag, or your food. Even if a piece of equipment is totally ordinary, you should probably use it a few times beforehand anyway. My dad brought the pack stove, and he was the only one who knew how to use it; the one time my brother and I tried to light it at dinnertime, we nearly set the Shenandoah Valley on fire. I still feel guilty anytime I see a Smokey Bear commercial. Trail safety starts with practice. Find a trail near your house, load up all the gear you’ll carry on the trip, and take a hike with your kids. Repeatedly. During the months leading up to our time on the AT, I took my daughter on six or seven of these practice hikes. Other day-hikers kept their distance and eyed me suspiciously, but it helped get my body used to the weight, and more importantly, I was able to teach my daughter trail discipline and watch how she tolerated the miles. It turned out that she could go about three miles without being wrecked for the rest of the day. On the AT, we walked 15 miles over five days—not including the cheat rides—so our average was right on point. It’s one of the few wins I got, in terms of reality matching the plan. If you don’t know anything about first aid, you should take a class. 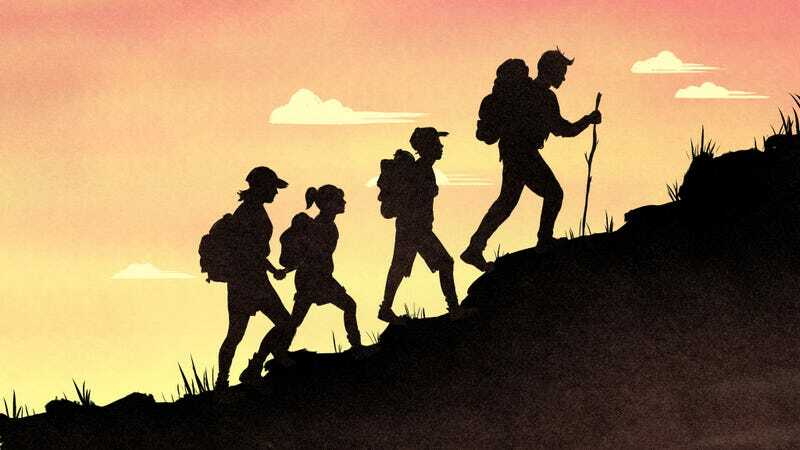 You’ll learn how to deal with sprains or burns (from a raging pack-stove fire, say) or heat stroke, and get a primer in what basic stuff to carry with you. I also carried a GPS tracker, which transmitted our location frequently and could’ve been useful in notifying the authorities if someone in our party had fallen off a cliff or been carried away by an eagle. If you’ve chosen a popular trail and brought a good map, though, that kind of tracker is probably unnecessary, unless you want to prank the friends and family monitoring the satellite pings by strapping it to the friendly raccoon you met at a trail shelter. Another over-the-top item I brought was bear repellant, which is just a hairspray-sized can of mace. When you pull the trigger, it empties in five seconds. That’s a lot of mace in a short amount of time! Had the need had arisen, I probably would’ve either maced myself or hit the bear in the ear instead of the eyes, thereby enraging it just enough to rip my face off. Once you’re on the trip, adapt to the circumstances and take what the weather gives you. If the canopy disappears and you’re in full sun, rest frequently and drink a lot of water. Forget the plan if it means pushing another few miles when everyone looks like Chevy Chase stumbling through the desert in Vacation. Also don’t ignore the signs of an impending thunderstorm. We broke this rule and got caught in a torrential downpour, and it’s the only part of the trip I feel really dumb about: If we’d been unlucky, a tree might have fallen on us, or we might have been hit by lightning, or dozens of other bad things that would’ve put my 6-year-old daughter in a very bad place. We all arrived safely at camp, but due entirely to good luck, not smart decision-making. Don’t forget that the whole point of this is that you want your children to (mostly) enjoy it. For instance, my daughter picked out her own snacks and the ingredients for our trail mix, so she had little treats all day long. As we walked, we sang silly camp songs and Katy Perry tunes. And she found ways to make a comforting routine for herself: She loved the ritual of unrolling our sleeping bags in the tent, laying out our pillows, and placing her lovey just so. If Providence presented an entertaining diversion, we took it. One day, we stopped at a campground right off the trail and got ice cream at their Olde Time Country Store. Later, when rain kept us from cooking dinner at our site, we went to the lodge to eat. Ice cream and chicken tenders: all the comforts of home! Finally, on the last day of the trip, we let my daughter pick our route. She chose a side trail that lead us bouldering up a mountain. Even though we were clumsy, and the rocks were precarious, and the wind gusted so forcefully I thought her skinny little body might be carried away, all of us were together again, laying down footsteps on one of our country’s most cherished monuments to those who refuse to relax on vacation. At the top, we sat looking at the entire valley spread out in a rolling carpet of green, and it was easy to imagine the centuries double-exposed, to picture the view as seen by some unknown indigenous traveller thousands of years ago, and to realize it’ll hopefully be identical to the view one of my great-grandchildren might see someday, on a backpacking trip with her grandmother, who first climbed to that vantage point when she was only six. It was the best moment of the trip. It was Independence Day. Illustration by Tara Jacoby; photos by the author.